Apple and Samsung have been fighting, battling back and forth for the right to claim thinnest smartphone bragging rights. When the iPhone 5 ships next month, Apple may indeed best the South Korean consumer electronics maker’s skinniest device to date. Apple’s current iPhone 4 and iPhone 4S are both the same 9.3mm thin. When the fourth generation iPhone shipped in 2010, it was easily the world’s thinnest, but those bragging rights slipped when Apple shipped the nearly physically identical 4S last year and the world marched on. And, for its part, Samsung claims “the nation’s” (i.e. USA) thinnest smartphone with the Infuse 4G at 8.99mm. However, it bears mentioning that the Infuse’s thickest point is chunkier — call it a baby bump — than Apple’s currently shipping best efforts. 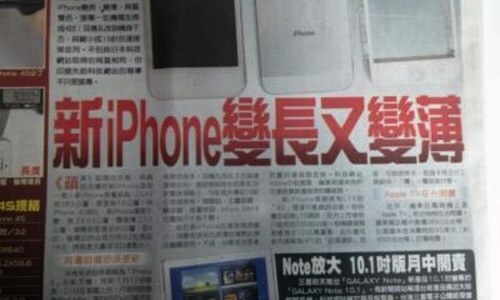 Now, the Apple Daily via Apple.pro (Chinese) reports that the iPhone 5 enclosure will be noticeably thinner than that at 7.6mm, which is about 20 percent skinnier than the 4S. The newspaper says the next-gen Apple smartphone takes obvious design cues from Apple’s MacBook Pro unibody design and that sounds like a good thing™. An unnamed Apple Daily source says that he measured a prototype used as the template by third-party case makers to create iPhone 5 compatible cases. As always, all beats are off until Apple introduces the real deal on September 12. So, does Apple best Samsung in the race to produce the world’s thinnest smartphone? Yes and no. The world’s thinnest smartphone, such as it is, is Oppo’s (China) Finder at just 6.65mm. However, the Finder isn’t available in the US and probably couldn’t be sold here — whereas it’s relatively “easy” to produce something that’s quite thin, tweaking the same device to pass the FCC’ stringent radiation tests is orders of magnitude more difficult.